I got a hug from Jensen!!! Yes, Teh Puppy went to the All Hell Breaks Loose Australian Supernatural Convention over the weekend and got to meet Jensen Ackles, Jared Padalecki and Misha Collins!!! WOO HOO!!!!! They are all totally awesome guys!!!! So how did I get a hug? Well, both days they had auctions. 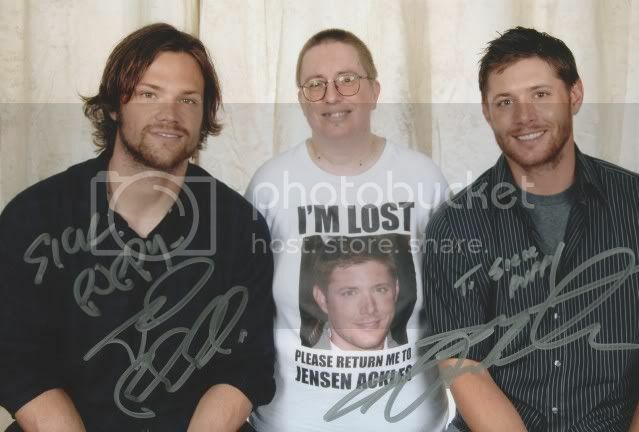 Both Jensen and Jared were given a plain white tshirt and a pen and set loose. Day 1 they were done separately, as the boys were not onstage together. Jared's shirt, which was auctioned first, sold for $1,200. Then, after Jensen's chat with the audience, it was time for Jensen's shirt. I tried, honest I did, but I hadn't really had time to work out how much I could realistically pay, so I dropped out at $2,000. At that time, there had been just two of us bidding, so they asked our names. I gave my real name, but also told them Sick Puppy. LMAO, in spite of saying she'd stick to my real name, the woman doing the auction quickly slipped into calling me sick puppy. :-) I was glad it was the girl who had originally bid against me that got it, as I would have been a little pissed if the 'latecomes' to the auction had got it. She got a big hug from Jensen!!! So, day two and I had sat down the night before, determined to win that tshirt. Jensen and Jared where on stage together, so they decided to do the auctions after they had finished chatting. Misha came up on stage to help out. So, someone bid $100. I went straight to $500. Misha was doing his best to get another bid, but no one was bidding. LMAO, being the sick puppy that I am, I knew that was nowhere near enough, either for Jensen or for a very worthy charity, the Starlight Foundation, so I thought 'the hell with it' and bid higher. Misha was laughing at me for bidding against myself, but that's mkay. :-) I did kickstart the bidding. I was starting to get a little worried and the girl beside me (Laura) kept asking me "What are you going to have to sell to buy this?" but I wasn't ready to give up. When they called out "Sold!" and it was my bid I just sat there stunned. I had won the tshirt!!!! LMAO, Laura had to poke me and say "Go up and get it!" before I moved. Then I threw down my camera (it's mkay, it landed in my bag) and ran up onto the stage, straight to Jensen. No, I was not one bit nervous, coz the only person I could see at all was Jensen. I swear, I was totally oblivious to all the people in the audience watching me! He showed me the shirt, which now read "i'm with stupid" and had a big arrow on it. He had held it up so the arrow was pointing to Jared. Misha had a quick look before scooting round to the other side of Jensen so he could laugh at Jared. He had also written Art by: and signed it. I asked him if he would write Sick Puppy on it for me and he did. Then he handed me the shirt and it was time for my hug!!!! OMG!!!! It was a full on, real, two arms around me and squish hug!!!! It felt like it went on forever!!! I can still close my eyes and feel Jensen's arms around me!!! Oh yeah, teh Puppy is having some seriously happy dreams, now!!! And all this on stage, with everyone watching!!!! It was amazing!!! I swear to you all, I had two separate fans come up to me after asking to have their photos taken with me!!! After that it was time to go get signatures on my pictures with the guys. (Will tell more about the photo sessions later.) First, I got to go to Misha. I had two photos of him and me to get signed. People had been telling us all the time not to ask for personal stuff, but since Misha was so sweet, thanking me and all, I thought "what the hell" and asked Misha "Can you write sick puppy on one of them?" I was totally unprepared for what he wrote!!!! here is the scan of it. Here's the scan of my sandwich shot. As there was a brief lull for Jared, I was telling him about people wanting there pic taken with me and told him I should start charging people. He told me "Why aren't you? You're famous now." Sooo awesome! I am still squeeing even after we got disconnected(stupid chick hanging up on us AGAIN!)! 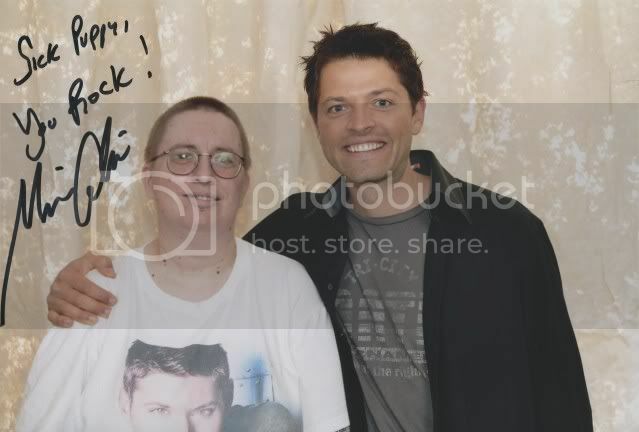 I love all the pictures-look at how huge Misha's smile is! Serious wattage dude!!!! *Does the happy dance* I can't wait to see the t-shirt you won-yay!!!!!! LMAO, ya gotta stop mentioning the stoopid chick and maybe she'll forget about us and leave us alone! misha woz awesome and so funny!!! :-) the pic from the second day i actually put my arm round him too! Misha!♥♥♥ I'd love that! And Mmmm... That's something you never forget man! Enjoy it always! Jensennnnnnnnnn!!!!!!!!!!!!!! LMAO, ya gotta be more careful!!! ya don't even have to mention her three timez!!! once iz more than enough!!! I promise! She who shall not be named is done! *Snorts* I think Misha is just now getting a taste of how the fans are with these cons he's attending-lol. He sounds like a sweetie! Oh yeah-a hug from Jensen? Like that? Where do I sign up? Just..yeah! And I saw what Willow wrote-as we got cut off-again I never got the chance to tell you about her wanting your auto! Heee! So since I see she's mentioned it below-I'll add it too! I hated getting cut off! i should hope so, after all the trouble she has caused!!! awww, misha woz awesome!!! very funny and so friendly!!! hehehe, i managed to crack him up onstage, along with quite a few of the audience. :-D for some reason the subject of poniez kept coming up. mostly bizarre referencez that made little or no sense. eventually he stopped mentioning them, then someone asked wot memory would alwayz stay with him. he thought really hard, then the person said "from supernatural" and he woz like "oh, i woz thinking of one from my childhood." Lmao, it woz too good to resist, so i yelled out "woz there a pony?" he totally lost it!!! oh yeah, it woz THE most awesome hug!!! *poutz* i want more!!!!! *snortz* it'z so weird!!! suddenly all these ppl want to be my friend!!! here and on myspace, although quite a few more on myspace. i have 67 friendz on there!!! WTF??? i din't even realise i knew that many ppl, but they sure as hell seem to know me!!! *sniggerz* i think i might need to borrow one of jensen'z bodyguardz if this keepz up!!! i actually have eight pix. two each with jensen, jared and misha and two sandwichez, which iz jensen one side of me and jared the other. wait, you want my autograph or you want my jensen autograph??? i did have three ppl asking for my picture with them and several wanted pix of my tattoo. I'm so glad, you deserve to have lots of fun, and if it's with the boys it's even better! LMAO, maybe my autograph should be a puppy pawprint??? wot do you think??? or maybe a quickly scrawled "pup?" it'z so bizarre!!! suddenly i'm getting all these new friendz, here and on myspace!!! just coz jensen woz sweet enough to hug me, suddenly everyone wont to be my friend??? that'z just insane!!! posted another blog about jensen and jared seeing my tattoo of them. poor jensen!!! i thought he woz gunna fall off his chair!!! :-P i got jensen and jared'z autographz added to the tatt yesterday. OWWIE!!! jensen'z goez up onto my ribz and they're right!!! it doez hurt more there!!! A paw print sounds perfect! Oh, I've heard that the ribs are a very painful place. I've got a tattoo on my lower back, and the places that it's close to my sides were quite painful to get, so I think I'll leave my ribs until I run out of space everywhere else! i guarantee you, you heard right!!! yeah, the base of the spine hurt, so did the hip and stomach, but my god!!! jensen'z signature across my ribz nearly killed me!!!! awwww, i know he iz!!!! why do you think i do these thingz to myself, if he wozn't worth it??? :-D my tattooist told me "close ur eyez and think of jensen hugging you!!!" while she woz doing his signature, coz she knowz how much it hurtz!!! the pain iz almost gone now, which iz good. and i know it'z healing well, coz it'z also starting to itch!!! DAMN IT!!! *snortz* good advice.....AFTER it stopz hurting!!!!! i usually find that some moisturizer helpz with the itch. I want your shirt HAHA LOL. nope, nope, nope!!! the shirt iz mine!!! he even wrote on it "to sick puppy, cheers," so it'z not going anywhere!!! I think, my heart melted. Jensen is adorable! I also read the entry that you showed your tattoos to him. He's great! Re: I think, my heart melted. i had asked him to write sick puppy on the tshirt, which he did before he gave it to me and the hug. so, i'm not sure if he remembered that or maybe he heard me ask misha. either way, it woz so awesome of him to do that!!! those two signaturez are now part of the tattoo. i had them done the thursday after the ozcon. i didn't really get to talk to him at the cocktail party, although we did get to say hi, but when i went to get my photo taken with him the next day i told him "i din't really get a chance to talk to you last night." he was like "awwww, i know!!! i'm so sorry about that." and i swear, he actually looked a little disappointed! LMAO, you should have seen jared pout when he realised i had twice as many tattooz of jensen. hehehe, i did manage not to laugh out loud at him. i blame jensen, though!!! i just showed jared the one of both of them. it was jensen who said to show him the other one. ;-) LOL, jensen was so excited showing jared the tatt. as soon as he saw me he was like "show jared the tattoo!!!" LMAO, that'z exactly how he was actinbg when he wanted me to show jared!!! like an excited 5 year old!!! :-) maybe he wanted to know more about tattooz, then again, maybe it was just that i spoke to him like a normal human being? no squealing or "OMG it's jensen." i didn't get tongue tied or babble. maybe he just liked the idea of talking to a fan that treated him like another human being instead of a god? who knows??? not sure if there will be another ozcon, but i'm hoping to save up enough to go to the US late next year. if i can, i wanna go to the chicago con with moondropz. i'm kidnapping her!!! he really shouldn't feel bad. i do love jared, he wouldn't be tattooed on my body if i didn't. i just love jensen more. as if i'm stoopid enough to go through that much pain for someone i just kinda like. "i wanna go to the chicago con with moondropz.i'm kidnapping her!!!" Please do that! :D That would be amazing. if i can, i will. i have already told her that i'll kidnap her if i have to!!! it's just not right that she has never met jensen!!! she will be going if i have to pay for the whole freakin' thing myself!!! hehehe, which is why the "if i can save up enough money" thing comes into it! maybe i just think differently from others, being a sick puppy and all, but i figure, how many chances am i ever going to get to talk to jensen? not many, so why waste them acting like a dork, when i can actually talk to him??? :-) i think they all must experience that to some extent. i was getting a little weirded out just with the ppl who wanted pix of my tattoo. then i had them wanting their pix taken with me! i know at the cocktail party when they brought misha over to where we were standing all the other girls in our group just sort of mummbled 'hi misha' and he just said hi back. not me! i still said 'hi misha', but i stuck my hand out to shake hands with him. so, big smile, he shook hands and he was all "hi, how are you? good to see you." LMAO, i bet the others were kicking themselves for not doing it too. yeah, i think jared was teasing, but he's not stoopid. he must see that there seem to be more jensen fans than there are jared fans. there must be times when he wishes he had more fans. ah, if that is the case, you probably need to think really hard about getting a permanent tattoo. once you get it, you have it for the rest of your life, unless you want to undergo painful laser treatments. i have over twenty, and i still love them all. I heard the same thing actually, apparently there were too much Jensen fans compared to Jared fans. If I go to a convention in the future, he's probably gonna' think that I'm a Jared Girl (I'm Jensen Girl LOL), because there's a good chance that I can be more comfortable around him. i'm usually very shy, but knowing he was probably feeling the same way kind of made it a little easier, i think. he is actually the second famous person that i adore that i have met. i figured if i could meet the other one twice without him thinking i'm a total moron, i could probably pull it off for jensen too. :-) LMAO, i'm normally a pretty goofy person. actually, most ppl who know me just say weird. i guess i was on my best behavior, coz jared didn't pick it up. the roar when jensen came on stage both days was almost deafening. we did yell for jared too, just not as loud as we did for jensen. and yeah, we yelled for misha as well. couldn't leave him out, could we??? pfft, what was he gunna do??? the worst would be not shake hands, but he was such a sweetie, i doubt it even entered his mind not to. I heard that Jensen is a bit shy, I think you did a great job on AussieCon.